The construction of Cobham required close communication with what was then called the Highways Agency. Highways England is the government-owned company responsible for operating, maintaining and improving most of England's motorways and trunk routes. In Scotland, Wales and London, the role is devolved to the regional assemblies. 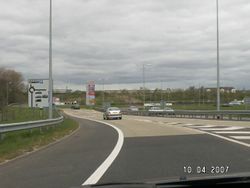 In terms of motorway services, Highways England are responsible for regulating the services on its network through an MSA Policy and signing agreement, and to work with developers over issues such as access and signage. As part of their duty to ensure the safe operation of their road network, they also need to encourage motorists to use services when tired. In 1969, the Motorway Service Area Branch (MSAB) was established to take the responsibility for identifying and regulating motorway service stations, on behalf of the Ministry of Transport (later the Department of the Environment/Department for Transport). In 1982 they merged with the Highways Lands and Services Division. 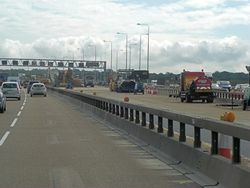 As part of various changes to the Department being made at the time, in 1994 the Highways Agency were created as an executive agency responsible for motorways and trunk routes on behalf of the Department for Transport. Service stations fell under their remit, under the Network General and Maintenance Division. Shortly before the creation of the Highways Agency, the government announced that they would no longer be proposing new services. This followed a number of occasions where the Department and a private developer had gone head-to-head with two rival plans, which was seen as a waste of resources, so instead the private sector would be entirely responsible. The Highways Agency later started highlighting areas where new facilities were needed. In their 2010 study into service stations, the Highways Agency admitted they maintained no list of the MSAs or TRSAs they regulated, and instead had to go about this study using a combination of this website, Google Earth, and by driving the length of their road network! The Highways Agency were converted to a company in 2015. Norton Canes is the newest service area on the list, as the site was acquired a long time ago. In 1982 the government re-negotiated the contract under which all of England's services operated. From now on the operator would pay the landowner (the Department of Transport) a peppercorn rent in exchange for a 50 year lease. These freeholds were passed to the Highways Agency. As part of the complete privatisation of the industry, they were instructed to sell all of them, in a process known as disposals. Some operators had been hoping to be handed the land as compensation for the contract change, but instead the land was sold to the highest bidder to encourage the operators to bid high. Highways England are responsible for providing safe lay-bys along the A-road network, some of which have an agreement with a trader to allow them to conduct business there. 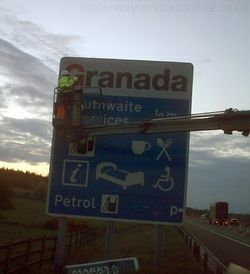 Highways Agency contractors changing a headerboard. As part of their responsibilities the Highways Agency created and manage the MSA Policy for England on behalf of the Department for Transport, and as such they have, in the past, made calls for the new services to be introduced. They have to be consulted on all major changes at services in England. They also work with developers during the construction and closure of service stations, especially if new signs are needed. Although they oversee the maintenance of their roads, approved contractors can make changes to road signs on behalf of an operator provided Highways England are informed. This allowed operators to frequently change their headerboards without inconveniencing the HE. The Highways Agency worked with the operators to provide interactive traffic information. Briefly, they published a guide to truckstop cafés in England, which included details of a small number of motorway services. Whenever there is a problem with fuel or the amenity building at an English MSA, they should inform Highways England so the pre-programmed motorway warning signs can be activated.